Power To The Potent Pinot!! OVER 60% OFF! We flipped for this powerful, juicy Willamette pinot upon tasting it, but the PRICE we managed to score??!! C’mon!! We live for negotiating sweet deals like this. Read the review! “...full-bodied, loaded with flavors of black cherry, black coffee and barrel toast...full and forward…” INDEED! This simply blew us away, but $13???? It’s silly. Got some?? Better hurry...We bought every single bottle the winery would sell us (we think we cleaned ‘em out, too), but it’s probably not enough to satisfy this nation’s growing need for screaming bargain pinot noir at this level of delish. OK, OK, whew, sorry, just had to get that across. Seriously, it is like 63% off. Amazing. Anyway, to the wine ---- it’s coming from arguably Oregon’s finest appellation, Williamette Valley, from 2400 foot (!) elevation vineyards, and it just POPS in the glass and in your mouth...imagine grabbing a pomegranate, a couple of ripe cherries and a piece of red whips and crushing it all in your hand. It’s SO fresh and lively, but then, suddenly, in your mouth, it puts on weight and throws a curveball of creaminess, mocha, and cola to mix it up with the berries. Super silky, almost glycerin-y on the palate, and a nice spiciness (though it's not at all oaky, really) hangs on for a good 30 seconds after you swallow it. Crazy good for our absurd price (what are we even doing?) 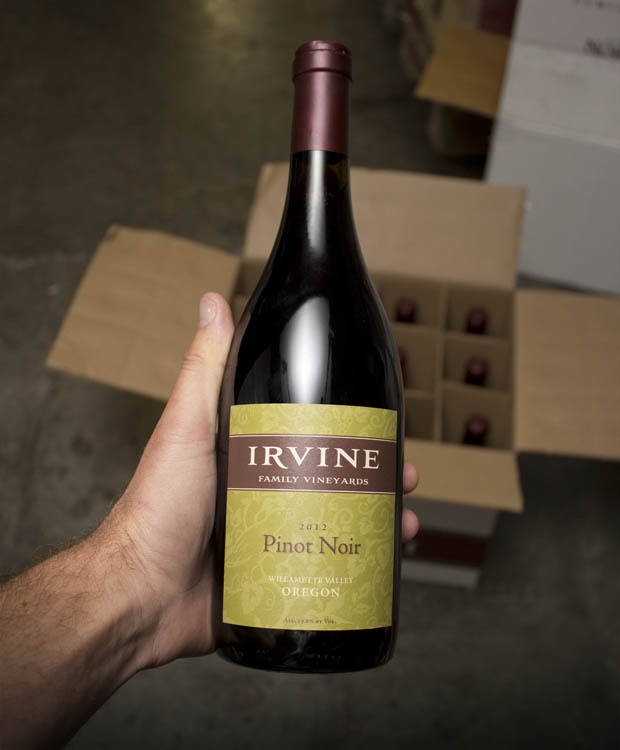 and a HUGE, colossal, leviathan-sized no-brainer if you love pinot. DO IT, but do it quick! First come, first served…! Irvine & Roberts Family Vineyards is an alluring family winery in Ashland, Oregon, where they practice sustainable farming and produce ultra-premium pinot noir and Chardonnay. The high altitude vineyard is adorned with distinctive soils, climate, and east facing slopes that produce wines with extraordinary balance, flavor and intensity. They believe great wines come from great soil, so they strive to be conscientious stewards of the land, protecting the vineyard soils through practices that are certified sustainable by LIVE and Salmon Safe. Grilled meats and chicken, as well as mushrooms, truffles and cheeses.